Protect yourself. Protect your loved ones. Read the world's largest collection of true crime self-defense stories and personal protection techniques. Fight-Back Files™ is the world's largest collection of true crime self-defense stories and personal protection tips. It will help you learn easy techniques to protect yourself and your loved ones. Fight-Back Files is read by visitors from more than 80 countries around the world. All posts, articles and essays on this site are copyright (©) 2010, 2011, 2012, 2013 by Jim Bender. 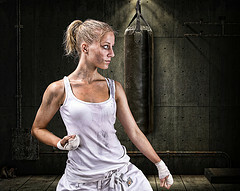 NICE ARTISTIC RENDERING of a strong young woman training to defend herself. Photo by Geir Akselsen via Flickr. Click photo for original. Teen boys protect woman and kids from crazy attack — but did they take it too far? Mass shootings and heroes: Should you risk your life? Are traditional martial arts necessary for self defense?